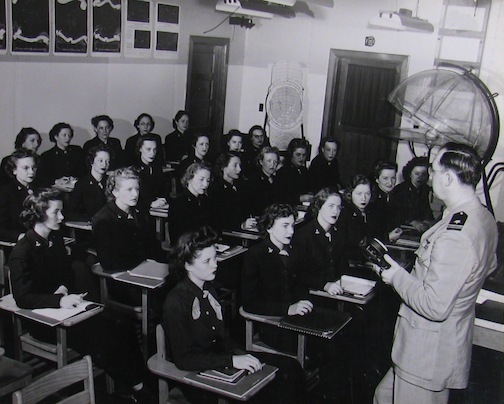 WAVES undergoing a 10-week course at Navy Link Celestial Navigation, Trainer Operators and Maintenance Schools at NAS, Seattle, WA. WAVES study the earth’s relation to the celestial sphere in order to train pilots in navigation. Here, Lt. (jg) M.L. Lansing, USN, Officer-in-charge of the Link Celestial Navigation Trainer School, briefs the WAVE students. The 1944 photograph comes from the National Archives.